Harlequin Mills and Boon have done a deal with oneword radio. On Saturday and Sunday mornings at 8am (repeated at 4 pm) they will broadcast extracts from the new Mills and Boon Audio collection. Because Oneword is digital, it is possible to listen over the internet. The programme will be introduced by the very lovely voiced Biddy Coady and I believe will feature interviews as well. First up is Penny Jordan's The Italian Duke's Wife read by Jan Francis. 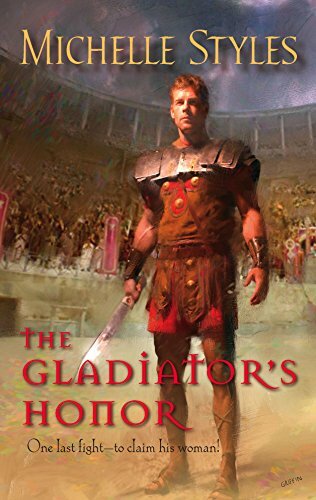 Fingers crossed that Gladiator's Honour will make an appearance as its reader Simon Poland has a wonderful voice. I discovered the US cover for Gladiator's Honor today. Note the change of hands for his sword. but a swarm in July isn't worth a fly. As it is almost July, can I get away with thinking that today's swarm isn't worth a fly? Iwas all set to capture if they landed within reason but off they flew into next door's garden. What is it with next door's garden this year? First the Naughty Duck decides to have her next there, and now the first swarm of the season lands there. I was feeling all smug and proud -- we had avoided a swarm and the honey was building up nicely, but no, despite cutting out the Queen cells two weeks ago, the bees took it into their miniscule brains to swarm. We have a ton of honey,I think --this year appears to be very good on the honey front. And there is always a late honey flow when the Rosebay Willow Herb comes into flower, and sometimes we get heather honey (which is a pain to extract) but...Just once I would like to avoid swarms. It would make me feel like a good beekeeper. There again the brood box is wall to wall bees and they will do what natures. The beeswill go out and populate the general area. Due to the varroa mite, there are hardly any wild honey bees left. It is one of the reasons why keeping bees is so important. Bees are essential for pollination of certain crops and flowers. But why do they have to be my bees, and NOT the horrid queen either. I finished the rough draft and my editor likes my Viking synopsis. So hooray I have to something to write next! I just found that Gladiator's Honour has been published as part of a special two in one release by Harlequin Australia. The title of the two in one is Society Whirl and there is a very Regency cover (last seen on a Stephanie Laurens reprint) I am not sure what Gladiator's Honour has to do with a society whirl but I am really pleased to be International!!! A Romance Reader At Heart has done a review of Gladiator's Honor and it recieved a Top Pick award. Hip hip hooray. last year when this website reviewed, The Lady Soldier, I was able to use the review to improve on my revisions for GH as there were parts of TLS that did not appeal to that particular reviewer. I learnt an important lesson, one that I remeber to this day -- heroeines should not be waterpots. I felt like I was living and breathing this story. The writing is superb and did not fail to keep me intrigued at all. The love story is breathtaking and made me wish that it would never end. Michelle Styles has found a new fan in me. THE GLADIATOR'S HONOR will be going on my keeper shelves, which I hope in the near future to fill with more of Ms. Styles' books. It is just really wow for me!! The sort of review to make me walk on air, particularily as I know this website has a reputation for not hesitating to pull punches. Now I have to concentrate on making VW the best it can be so that it does not fail to live up to expectations and fingers crossed it can help fill more people's keeper shelves. In today's post I got a book on Women in the Viking Age. This is a very academic book, looking at the whys and wherefores of historical and archelogical evidence for how women lived durig hte Viking Age. The primary source documentation for the age is mainly the Icelandic Sagas. However, because they were all written several hundred years after the events, we have no way of knowing how much they tell us about the actual events and how much they tell us about Icelandic society at the time of writing. There is an adage in historical writing that the writing/subject matter is a glass through which one views his or her own age. For example, one reason for the huge popularity of the Regency novel in the 1990s and beyond could be perhaps explained by the huge technological and therefore societal upheaval that was going on. This in some ways rivals the Internet revolution. However, it could be that women just like to read about men in tight buckskin trousers. What we don't know today -- because Icelandic sagas were works of fiction that closely mirriored historical records -- how much was an accurate reflection of Viking society. For example, what was the extent of warrior women. Yes, they are an archetype in the sagas BUT they generally come to a sticky end. How much is allegorical? Still the sagas and their traiditons give me a lot to work with. In any case, the book basically confirmed what I wanted to do with my first Viking story, and so I was able to complete my synopsis and send that off to my lovely editor. That is one thing off my desk and onto hers. I have two more pieces of work to get off my desk -- my Victorian synopsis and finish my wip. I did my Viking synopsis this morning rather than working on VW In my defence, the wip is getting better and I am happier with it. It will be done in time and it will be the best I can make it at this time. But I still want the thing finished NOW!!! The Victorian is going to need thinking about, but I am starting to get some good ideas. But at least I don't have to think Viking until I get to Iceland and then I can start writing in a new Moleskine notebook. My very dear friend and writing mentor, Kate Walker is running a bag of books contest as she is busy celebrating her writing friends. I am absolutely thrilled and excited to be included as the list includes such luminaries as Michelle Ried, Liz Fielding, Julie Cohen, Anne McAllister and Kate Hardy. As Kate's wonderful words of wisdom really helped me when I was first start getting serious about my writing, I am really honoured by what she has said about me. To spend time in Kate's company is to come away inspired. As she has blogged, the last face to face conversation I had with her resulted in the premise for Sold and Seduced. And for any aspiring writer, I can heartily reccommend Kate Walker's 12 Point Guide to Writing Romance as a must read. It is all there. If you haven't yet entered her contest, please do so as the books spotlighted are all fantastic reads and include one that both Kate Hardy and I have tipped for next year's awards -- Liz Fielding's The Marriage Miracle. I had a post from Laurie Campbell who did an enlightening workshop about ennegrams two years ago on e-harlequin. It changed the way I develop characters. Anyway, she has now written a book on the subject and it will be available soon. I am so looking forward to it as it is specifically aimed at writers rather than psychologists. So it will be about creating characters through ennegrams. Because of the post, I went back to my ennegram book and started rereading it. It is useful to do this at this stage of the wip, to remind myself of the character's primary motivations. It is also helpful as I am thinking about my next two synopsis. Where the clashing points are going to be. It is one reason I am glad about owning books rather than just getting them out of the library as I can go back and reread them, reabsorb the info. We now have three other ducks sitting on nests. I would like to gather up the eggs, but my dh says the ducks are happy. One duck (the Mother duck from last year) is sitting on 13 eggs. Okay, what are we going to do if these hatch? We can not turn the whole garden over to a sanctuary for ducks. My dh says that the eggs will not hatch. Umm that is what he said last years, and this year....I think I can afford to give them a week or two more and at least then the pen at night isn't overly crowded. The current crop of ducklings are doing well. The littlest one has now caught up with the other ducklings. They are quite content chasing flies and drinking water from the water container. After last year's catastrophe, we are not putting a duck bath in the pen. All that can wait until they are older. And congrats to my two critque partners who had full requests on Friday from HM&B. My fingers are firmly crossed for them. And hopefully I have been as big a help to them as they have been to me. My wonderful editor emailed me the blurb for Sold and Seduced today. It reads rather well, I think. On Monday, the bee inspector came and gave the bees the all clear. It looks as if we shall get enormous amounts of honey this year. One colony looked like it was making plans to swarm but hopefully the preventative action the bee inspector took -- cutting out unsealed queen cells and drone bracing brood, and adding a super will make them think twice as the queen has a lovely laying pattern and is wonderfully dolcile. The other colony where I had sorted of hope the Queen would swarm so no signs or inclination. There is however a ton of honey. He also that the hives were well maintained. The ducklings are doing well -- growing. I must put a photo up, except they always run under the Naughty Duck when I advance with the camera. the ND has decided that the duck house is sole property and is not allowing the other ducks in, so they are sleeping outside at the moment. I shall give them a few weeks to allow the ducklings to grow and then they will all be herded in as I have this fear of foxes. Can you imagine before you see? Yesterday I was reading an extract from Mary Gellhorn's Letters in the Sunday Telegraph. Mary Gellhorn was a journalist and briefly married to Ernest Hemingway. In the letter that she wrote to Mehingway shortly before they ended their marriage she says: deviously, everything I have ever written has come through journalism first, every book I mean; since I am not Jane Austen nor the Bronte sisters and I have to see before I can imagine. Seeing before imagining. I have never thought of it before. Which do I do? I think a combination of both. there are times when seeing something can aid writing no end. Places often have a special feel about them, but many of the places I describe exist nowhere outside my imagination. They are things I have created based on research but htey are not actual. I can remember when I was at Carleton, and taking a modern literature course (this was not a happy experiencebtw) but we did have to keep a journal of images. Now, it never occurred to me NOT to write down the images I had in my brain. After all they were far more intersting than the simple things I saw when walking through a Minnesota winerscape. I did get asked thoogh -- where I had seen some of the images...I can't remember if I ever did admit it to the professor though. I suspect the neeed to see before one can imagine explains why some people are more suited to non fiction writing than fiction writing. But I thought it interesting. The naughtly duck has reappeared with three ducklings. We had to drop everything this morning, herd them into the pen and rapidly construct a crow exclusion zone. Now I am left with a dilemma. I can not pout all the ducks into the pen and keep them locked up for weeks on end. It did my back in and it was not any good for the ducks. I suspect the answer is going to be to build a sepearte enclosure for the naughty duck and her ducklings. Then when they are old enough to allow them the free run of the garden. It is the only thing that makes sense...But n ot what I need when the bee inspector is arriving, the decoartor is here, and most importnatly I am on the last 15k of my wip and all I want to do is write. Today is Friday and the sun is shining. Northumberland, for once, is basking in glorious weather. Since this point last Friday, I have written 60 pages and I should be well on my way to reaching my deadline. Hooray. I have found since I deliberately upped my daily output that the words are flowing easier. Of course I refuse the right to change my judgement. But at the moment, it is great fun to write. My acceptance cheque for Sold and Seduced arrived today. It is a woderful feeling to have successfully completed a contract. It will be an even better once I get the next one accepted. Here's hoping everyone else is having a good Friday. On Friday, I received the lovely news that the mss formerly known as The Pirate's Bargained Bride will officially be called Sold And Seduced. I am very pleased the Historical Editing Team came up with such a great title. It reminds me of the old titles I used to buy back in the mid 80s. With this title, I wouldn't even have bothered with the back cover, I would have had to have it. Fingers crossed they do commission artwork for it as they did for A Noble Captive. I can hardly wait to be able to post the final cover as the mock ups are lovely and inspirational. They are up on my wall. If I get that sort of quality, I will be very happy indeed. The thing about titles is that they are a marketing decision. As long as I can concentrate on making what goes inside the covers the best it possibly can be, I am very glad to put my faith in HM&B's ability to sell books and this involves the cover choice, title and back cover copy as well as the teaser in the front. They have far more expertise in it than I do. Currently I am hard at work on VW. I want to have it finished within the next few weeks, so I will have time to edit it before handing it to my editor. At the moment, I think it is pretty good, but I have to keep reminding myself of the hard lessons I have learnt. First and foremost to make the turning points proactive, rather than reactive. My friend and fellow M&B writer, Julie Cohen, has a new release out -- Delicious available at all good bookstores such as WH Smiths, Easons and Borders as well as Mills and Boon online and Amazon. It is the tale of a celebrity chef and the English teacher who brings him to his knees. Last weekend when my back was really playing up and my dh decided that rather than looking white and moving slow, I was spending time resting, I spent several happy hours reading it. I was interested to read the book for several reasons. first, I knew it was a book she had written the first draft of early in her career, second it was set in a school, third it has Ewan MacGregor as hero inspiration material and finally live chickens play an important role. While many may think Julie's inspiration was Jamie Olvier's assault on the poor state of cookery and school dinners in Britain's state schools, she actually came up with the idea long before Jamie highlighted the problem. But because of the nature of publishing, the book has just been published this month. It is a cracking escapist read. I enjoyed the romance between the two protagonists, the well drawn setting of restaurants and schools as well as the chickens. And by the time I had finished, my back was feeling better. If you want to learn more about how Julie wrote the book, revised, revised itagain and finally sold it, it is worth visiting her blog. It gives a lot of insight into the process she used and why sometimes rewriting can take a lot longer than writing something new.